It’s Throwback Thursday so let’s go back through Upper Deck’s trading card history and come up with a fun giveaway. The Chicago Blackhawks woke a sleeping giant last night as the Los Angeles Kings exploded in the third period to take Game 2 on the road. Not since the days of “The Great One” has there been this much excitement around the team. 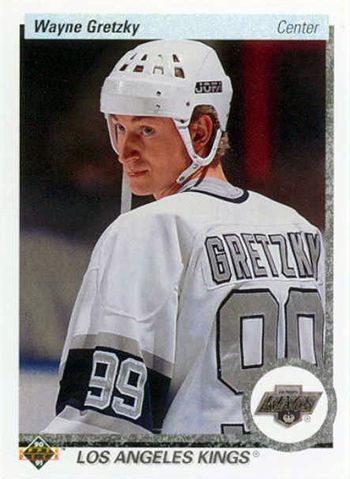 So let’s put up a throwback card of Wayne Gretzky from his days with the L.A. Kings and see if our fans can come up with some great captions for the card! Please share your comical caption to this card for your opportunity to score five (5) packs of 2013-14 NHL® Fleer Showcase! You have until Friday morning, May 23 at 8:00 a.m. PT to post your caption before this promotion is closed. I’m going to win how many Cups after leaving the Oilers? Who do you think you are? Wayne Gretzky? I’m glad the kings are still playing in spring, I’d hate to be out of fashion wearing white. Look for my face on a cereal box. My turn to do the penaltu shot! Oh! Let me check again, i just want to make sure Marc Crawford is not my coach!! The come hither look Wayne used to Woo Janet. Did that ref just give me Sass?! Well Excuse me! You know while I will miss the Oilers, I sure look good in silver! You got 99 problems and me scoring is # one!! Who was just born??? Crosby…??? they r saying he is the next who??? I call this one blue Steele!!! 99 stitches?! That’s nothing! Every player to ever play against me needed that many stitches to heal their teams wounds after I was through with the game. It was great!! Yes, there are 99 stitches in this jersey and not one of them has a thread. I always knew that I’d be great for 20 years when I started out way back in the summer of ’79. Flash forward and it’s 99. Get it 99 in ’99?! Ya that’s right…I got this! First me…now Mark! Don’t worry buddy, we’ll be together soon. And there goes any more cups for Edmonton! I got my eye on you, Stanley…….! Come on…Really? I have been assessed a 2:00 minor for Roughing? I can see how # 33 and # 99 look the same but it was Marty Mcsorley I swear!!! This is breaking my heart, Gordie! I got 99 problems but scoring aint one ! I only had 40 points in the 92-93 playoffs…..let’s see one of you top that! Really I have to show you again?? Did you see how crappy my pro set card was? Really? What? Are you looking for trouble? are you looking at me yeah I am the great 1. its been your pleasure. Seriously guys? I know that you are all happy that I’m a King now, but you don’t need to be dancing to Pharrell Williams’s “Happy” while the puck is in play against the Quebec Nordiques. They might score!